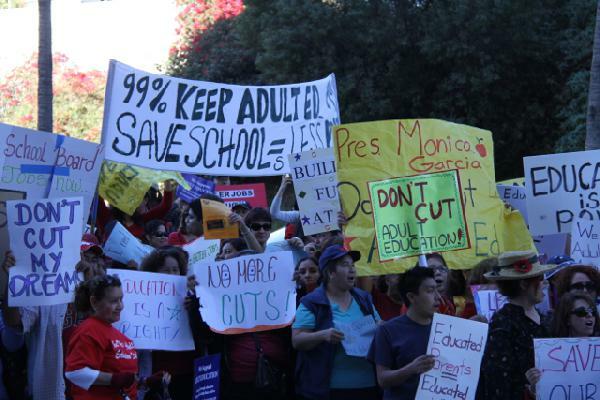 The ongoing struggle to save LAUSD Adult Education continues. Please come to the Save Our Adult Schools Rally Thursday, March 29, 2012! Using State of California budget shortfalls as an excuse, Los Angeles Unified School District's (LAUSD) Superintendent John Deasy presented the LAUSD Board of Education (BOE) with a draconian budget that effectively cut some of the most crucial programs in the District. With enthusiastic collaboration from LAUSD BOE President Monica Garcia, Deasy's chopping block included the District's Student Readiness Language Development Program (SRLDP), Early Education Programs, District-wide Elementary School Arts Programs, and the entire Division of Adult and Career Education (DACE). Deasy, a former executive of the Bill and Melinda Gates Foundation and a graduate of the [Eli] Broad Superintendent Academy, was brought into LAUSD to implement a stark program of neoliberalism. The Superintendent's proposed cuts are intended to hasten the privatization of the school district, much like his fellow Broad Academy Graduates (or Broadytes), Deborah Gist, Michelle Rhee, and Jean-Claude Brizard have in other cities. Superintendent Deasy and the likeminded neoliberal BOE members — Monica Garcia, Tamar Galatsan, Dr. Richard Vladovic, and Nury Martinez — didn't expect much resistance to their cuts, and had planned to vote on their education massacre on Valentines's Day. Fortunately political pressure emanating from a broad and dynamic movement spearheaded by Adult Education students, allowed BOE member Steve Zimmer to move not only to delay the vote, but to instruct the Superintendent to provide a budget with different options. The BOE, some of them quite reluctantly, voted yes on Zimmer's motion, temporarily saving not only adult education, but the other programs slated for elimination. Within days of learning that the District intended to cut the entire program, students and teachers began organizing a coordinated response that was unprecedented in its scale and scope. Since the DACE program serves some 347,000 students, there was a sizable pool of individuals willing to get involved and save their schools. One of the first actions was a citywide petition drive. Students, activists, and teachers worked frantically to collect signatures supporting DACE. By Valentines's Day Adult Education was able to provide the BOE with petitions containing 220,000 signatures of support. Reaching out to the business community, as a sector which benefits greatly from an educated workforce, activists were able to get large numbers of business to display signs stating their support. These were photographed and sent as evidence of broader community support. Websites were set up for both the student organization — United Adult Students (UAS), but also a general website for the campaign. Activists set up a phone system that allowed callers to dial in and just by entering a code for their school, would connect them to the appropriate BOE member to make their feelings known. As the campaign progressed, phone calls started being routed to other public officials. In addition, letter writing campaigns were launched. In many cases local politicians were asked to write the BOE expressing their support for DACE. Activities weren't limited to lobbying style, however. Large rallys and pickets held at individual schoolsites brought excellent media coverage, particularly in the Korean and Spanish media, and more public exposure in general. 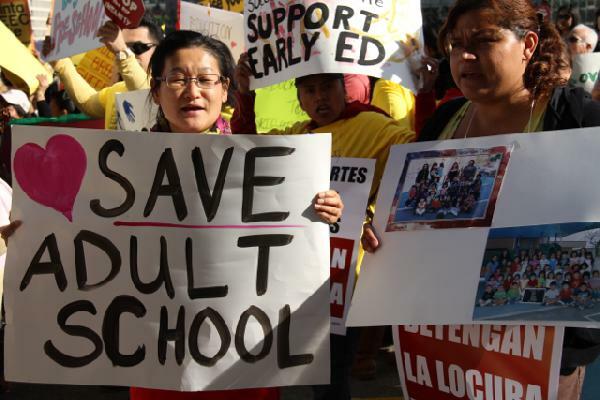 Since large numbers of Korean and Spanish speakers are enrolled in DACE English Language Learner programs, the media coverage mobilized large numbers of community members who otherwise might not have known that Garcia and Deasy had Adult Education on the chopping block. The individual rallys culminated in a large 3,500 person protest at LAUSD headquarters on the Thursday before the BOE vote. Adult Education supporters again showed up on Valentines's Day to join supporters of the other threatened programs, closing down Beaudry Avenue. While thousands thronged the streets with banners and signs condemning the cuts, the LAUSD Board Room was packed with DACE supporters and speakers. All of the outreach to local politicians paid off. Among the speakers supporting Adult Education were Los Angeles City Council Members, representatives from other local politicians, and the Mayor of the City of Huntington Park. Other speakers included graduates of DACE, currently enrolled students, and educators. One of the most moving speeches was by social justice educator José Lara, who finished his presentation with a scathing indictment of the cuts by saying "ladies and gentlemen, this is an educational injustice." The campaign has also received national attention, with the Washington D.C. based National Coalition for Literacy publishing a series of articles from students, educators, and activists on the ground, each highlighting various aspects of the struggle. The series, entitled, Cut the Excuses, not education, is an excellent resource both in terms of the documenting the struggle, but also providing ideas for other struggles. On March 13, 2013, the Superintendent presented a budget that still zeroed out many programs including DACE, but explained that the District would revise the budget based on two conditions: first that the United Teachers Los Angeles (UTLA) take yet another pay cut (most likely in the form of furlough days), and second, that the state somehow is able to bolster the District's budget. The BOE voted six to one in favor of the demoralizing budget. While many see this as a hardball negotiating tactic against the union, the effect on student morale has been severe. Fortunately, neither the students, nor the educators that serve them are considering giving up the fight. Preparations for future actions are underway, and the continual outreach to organizations like Neighborhood Councils hasn't stopped. There's a great deal of work to do, but the stakes are too high for the community to give up. United Adult Students are also supporting other cut LAUSD programs including SRLDP, Early Education Centers and Elementary Arts. Superintendent Deasy and President Monica Garcia thought they could adults against children and program against program. We aren't falling for that, Garcia and Deasy are the problem!